The Point of View villas overlook Apollo Bay and the Great Ocean Road. Its location, in-room facilities and extra little touches makes it ideal for those romantic getaways. 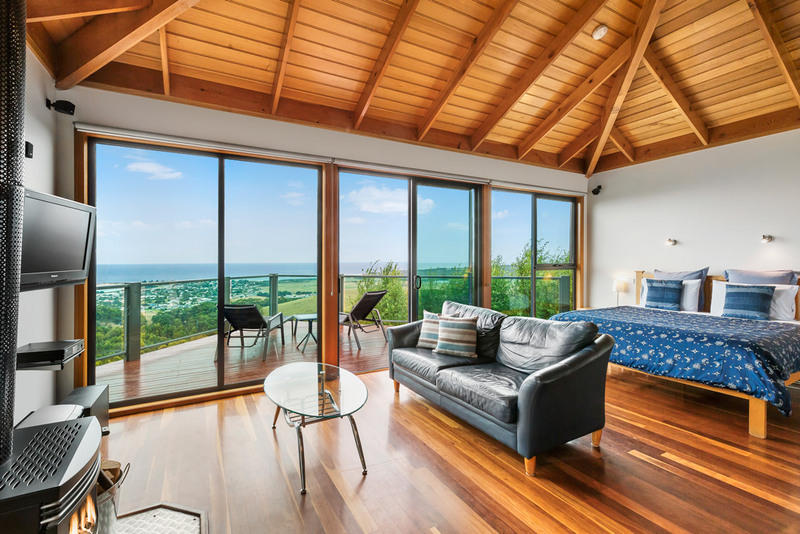 Perched on top of a hill overlooking Apollo Bay and the Great Ocean Road, you will find Point of View. These 5 architecturally designed villas are surrounded by lush gardens and positioned to ensure privacy for all guests. Uninterrupted views of Apollo Bay can be enjoyed from the kitchen, bed, lounge and even the spa. Guests can also enjoy the view on their very own double balcony which has outdoor furniture and a BBQ. Each self-contained villa has a fully equipped kitchen with a dishwasher, cooktop, oven, full size fridge and cooking utensils. Extra little touches include fresh flowers, handmade soap, plush robes, an iPod docking station and a collection of DVD’s and CD’s. Continental breakfast supplies (cereals, breads, speciality teas, etc.) are also provided. The location and in-room facilities makes Point of View the perfect romantic getaway whether it be for relaxation, proposals or anniversaries. 2 hour and 35 minute drive from Melbourne CBD. 1 hour and 25 minute drive from the 12 Apostles. When driving to Point of View, turn right directly after the 50km zone sign as you enter Apollo Bay from Melbourne. Travel 1 km on sealed road then 1.5km on gravel. Point of View driveway is on the left with a sign at the entrance. Cancellation between 15-30 days will result in loss of 50% of booking cost. Cancellation less than 15 days will result in loss of 100% of booking cost. Each of the villas is fully self contained. Floor to ceiling glass across the front of each villa allows uninterrupted views, whether youre relaxing in the king bed, snuggled up on the couch or preparing a meal in the fully equipped kitchen. Each villa has a gas log or wood fire and electric heating and air conditioning. The bathroom has been designed with the same stunning outlook. Imagine showering or soaking in the spa with those amazing views. Each villa is strictly for 2 people only. Linen is included along with robes,continental breakfast supplies, Weber BBQ on the deck and Foxtel.